I spent the better part of Saturday trolling Cleveland’s West Side Market – a kind of Midwest food Mecca – seeking inspiration. You can find everything there – more pork products than one could consume in a lifetime, local cheeses, gyros, smokies, baked goods, pasta – there’s even a creperie. As I perused the fresh produce I picked up a bushel of radishes for the cool price of $1 and knew what I’d be making come Sunday. Hillary and I were discussing Ina Garten’s radishes with salt and butter the other day and I thought it time to give it a try. Being that the only thing I had to do on Sunday was to make herb butter I decided to make LOTS of herb butter. 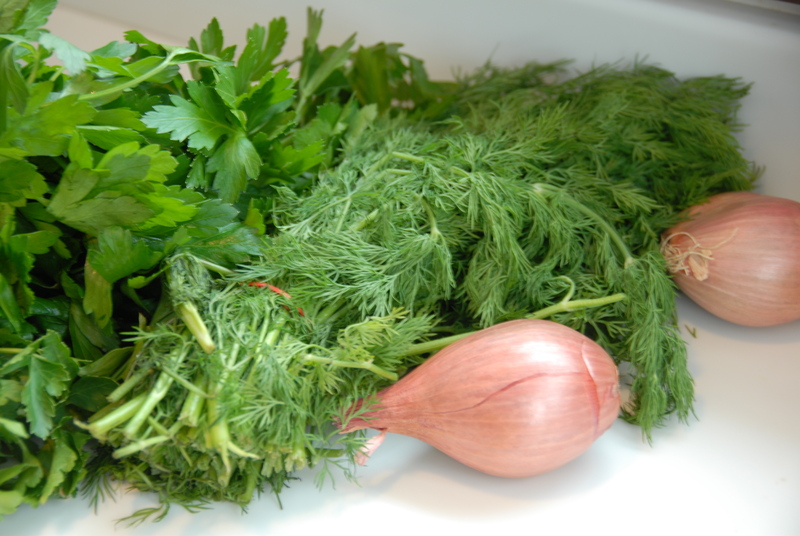 I started with Ina’s recipe – bring the following together and mix, don’t whip, until it’s well incorporated. For my next batch I made tarragon and chive butter – I mean, how good will that be with eggs? 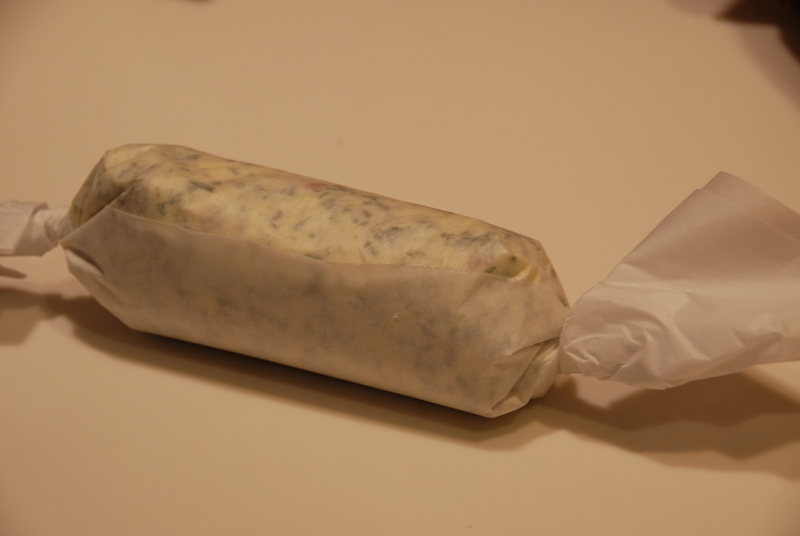 I used parchment paper to roll the butter into log form to be stored and enjoyed in the (near) future. Once I had my fun mixing up various butters I assembled the butter, salt n’radishes. 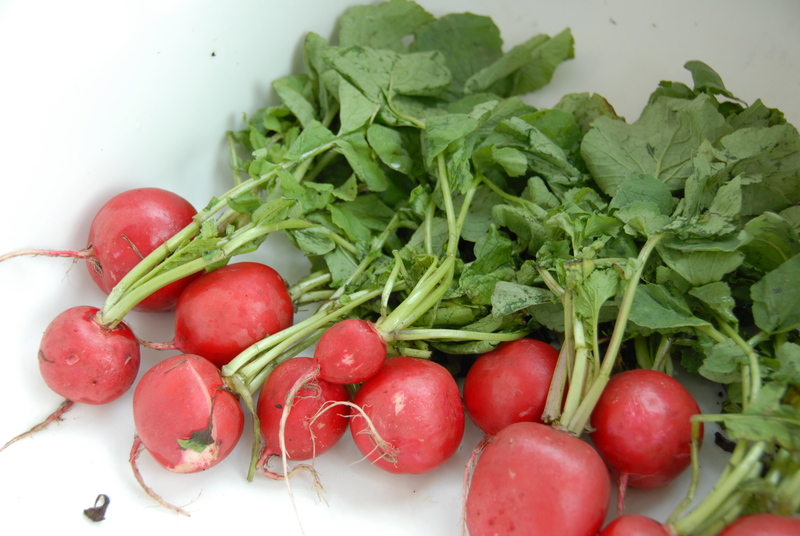 I sliced the radishes thin and placed two atop a piece of lightly toasted baguette that was smothered with herb butter. I then sprinkled a good bit of salt on top. Goodness! The peppery, watery radish accompanies the salty, silky butter and punch of fresh herbs so well – it’s positively luscious. To round out the salty smorgasbord I cut up a little parmigiano and sprinkled salt and olive oil over fresh mozzarella… and what’s that in the corner? A little prosciutto? 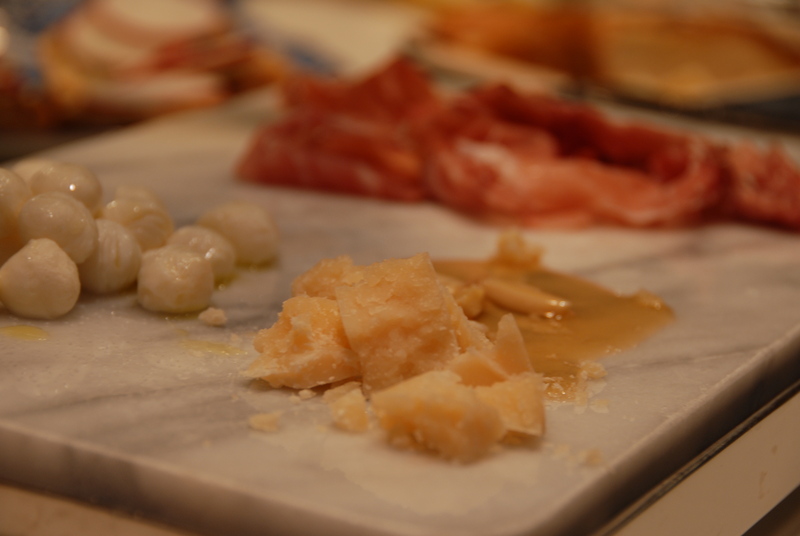 I couldn’t help myself… Side note: while discussing starting this very blog over a charcuterie plate at Eataly this fall Hillary and I discovered a wonderful thing. Accompanying the heaps of meat and cheese was a heavenly almond honey – as you can see above I tried to recreate – not quite as good as Batali’s but it was close. I simply combined a little amaretto liqueur, honey, and sliced almond. The combination of the honey with the salty, nutty parm is divine. So… the next time you’re feeling like a little salt, or just a little salty, I strongly urge you to give these a try. This entry was posted in Butter, Salt and tagged Batali, butter, Eataly, herb, honey, Ina Garten, parmigiano, prosciutto, radish, salt, West Side Market. Bookmark the permalink. Mmmmm do you think you can send me that butter via FedEx? YUM!